I recently went on a short vacation to Pensacola, Florida, when I saw one of my dearest friends married on Navarre Beach. We also visited the Pensacola Lighthouse, toured the National Naval Aviation Museum, explored Downtown Pensacola and spent a great amount of time wandering through Fort Pickens, today a National Park. 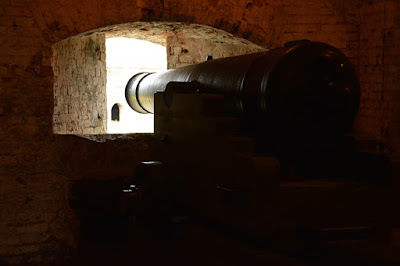 I'm going to share here 10 bits of trivia or tips that I picked up on during my visit to Fort Pickens. 1. 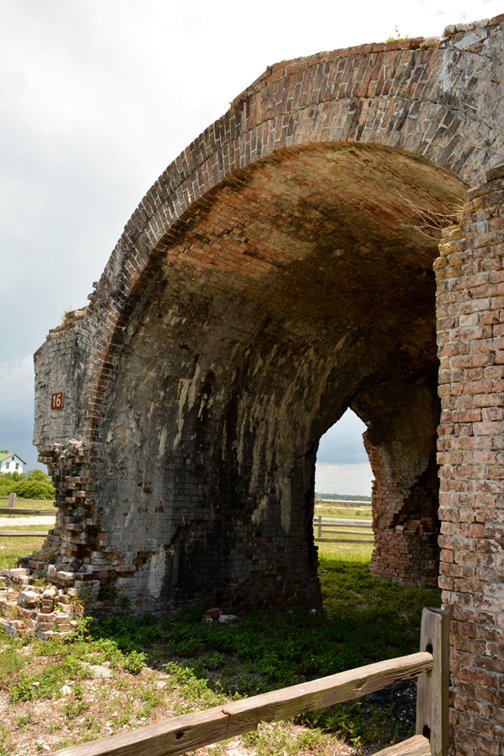 Construction on Fort Pickens began in 1829, at the time one of forty forts to protect our coastal borders. It's of a pentagon shape, designed for more than 200 cannon and built with more than 21.5 million bricks! Constructions was completed in 1834, with quite a storied process. 2. When you visit, get a map, find a tour guide, do research. There is a considerable lot to explore and discover here...more than what we realized! I totally want to visit again when I return to Pensacola! 3. One summer morning in 1899, there was an explosion. 8,000 pounds of gunpowder showered debris across Pensacola Bay. Flying brick fragments killed Pvt. Earle Welles and injured Pvt. Henry Hopgood. Visitors can today still see signs of that deadly explosion. 4. 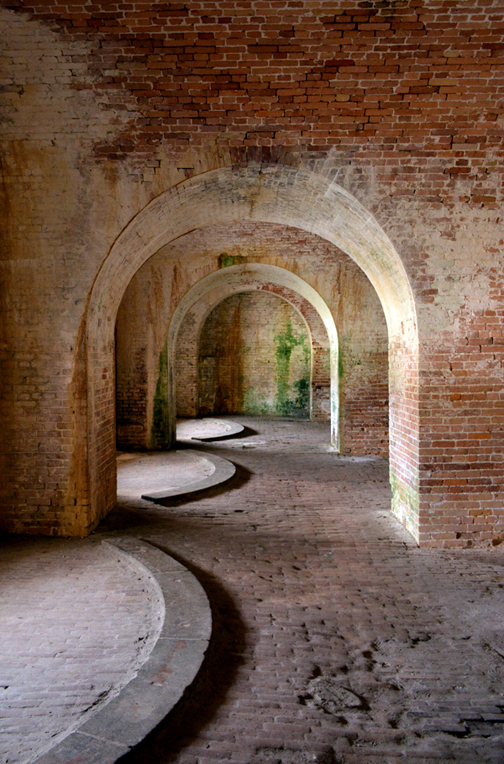 To support the weight of the fort on a foundation of sand, engineers used arches...lots and lots of arches! 5. 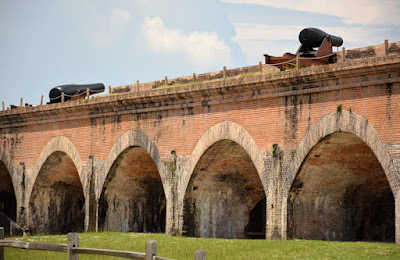 Fort Pickens, as well as Pickens County, Georgia, Pickens County Alabama, and Pickens, S.C. (where my mother is spending retirement years), are all named for General Andrew Pickens, a Revolutionary War soldier who was born in Pennsylvania and eventually called South Carolina home, where he passed in 1817. 6. Those are cannon platforms in the above photo. 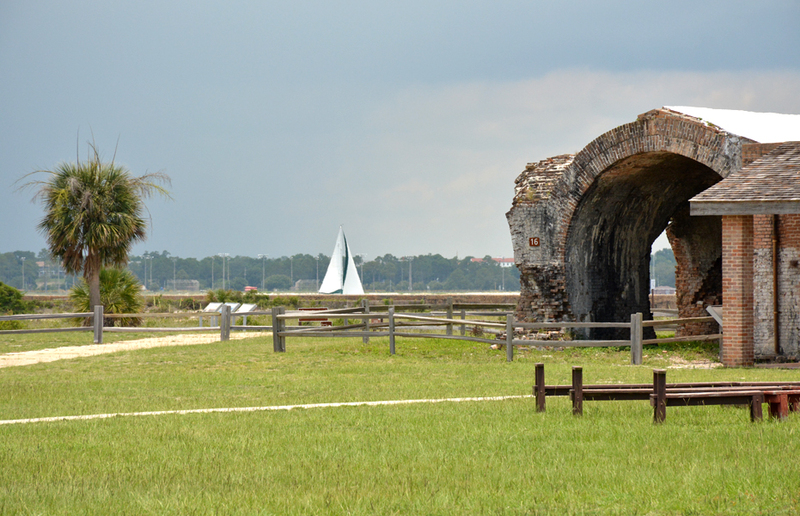 This fort is formidable and fascinating at the same time. 7. Did you know that this is the 100th anniversary of our National Park Service? That made this visit to Fort Pickens even a little more special. Have you explored all 11 National Parks in Georgia? Since this post is about a State Park in Florida, I'd be remiss to not mention that there are also 11 National Parks in Florida. Go, explore, have a great time in our National Parks! 8. 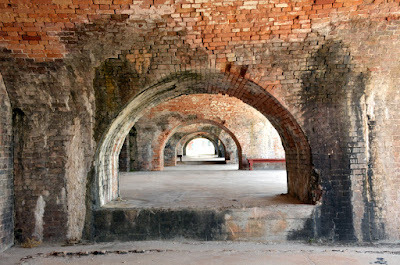 Fort Pickens is a fort within a fort! 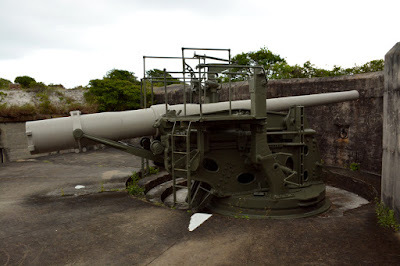 By the last 1890s, the brick and stone fort had become antiquated and no match for newer weapons. 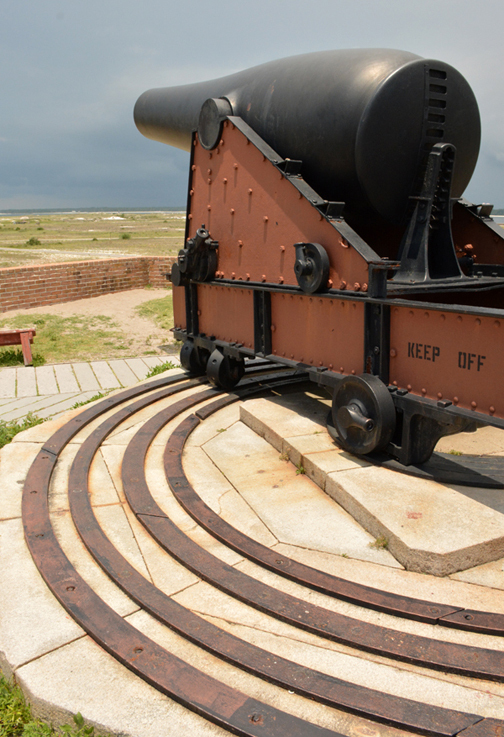 Completed in 1899, Battery Pensacola mounted two 12-inch rifles on disappearing carriages, that could be retracted after firing. Their 1,070 pound shells could be shot at targets eight miles away! You'll know it's Battery Pensacola because it's painted black—to reduce glare from the sand and water. 9. 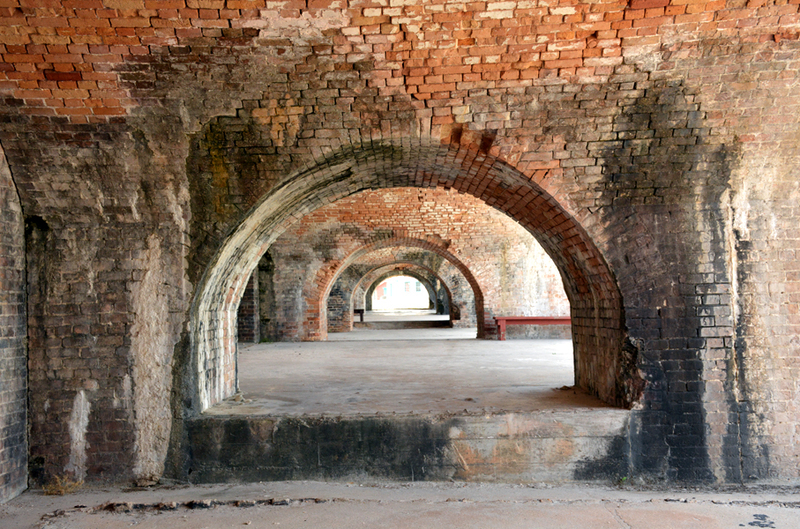 Fort Pickens closed in 1947, having been declared "surplus". Guns, railroad tracks, and steel towers were salvaged, leaving only concrete remains. Certain artifact were added later. A State Park in 1971, it joined and became part of Gulf Islands National Seashore, and will forever remain part of our history, present and future. I highly recommend a visit! 10. 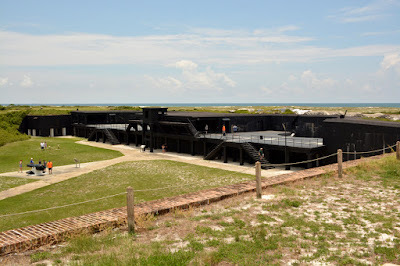 Fort Pickens also has a museum and an active fishing pier. 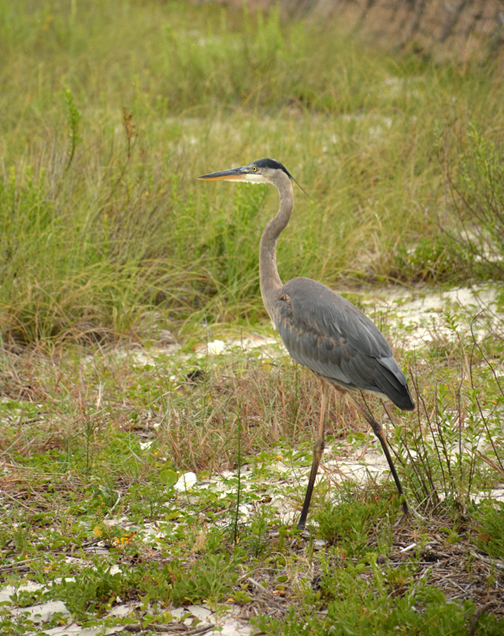 We did not take advantage of those, but we did see the above pictured beautiful Blue Heron. He walked around with us for about 15 minutes! Stunning creature. 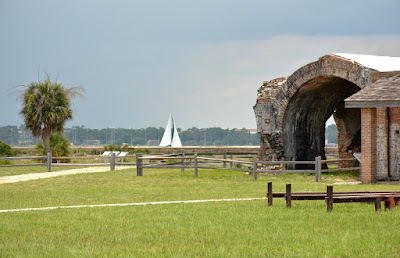 Fort Pickens offers a number of campground sites, so if you're looking to camp anywhere in or near Pensacola, this would make for a unique and rather fascinating choice! Help the National Park Service celebrate its 100th birthday by visiting a National Park! You know you're going to have fun!